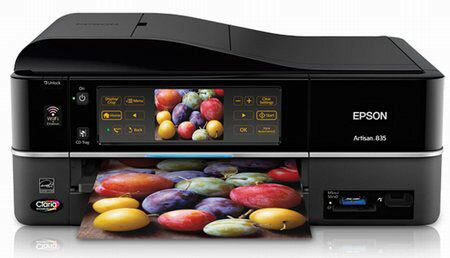 Artisan 725 and Artisan 835 are two new multifunction inkjet printers, which have been announced by Epson. They are designed to print text and photos, as well as scan and copy a variety of documents. Being moderately priced ($300 and $200 for Artisan 835 and Artisan 725, respectively), the new devices can print in up to 5760×1440 dpi resolutions and produce 10×15 cm photos with supernatural, high-quality reproduction of colors . Both MFPs can work autonomously, without connecting to a computer, since they have a built-in card reader to print documents and photos directly from memory cards. These models also have USB port for flash drives and hard drives, and even they can be connected to LAN using WiFi module or built-in network adapter. 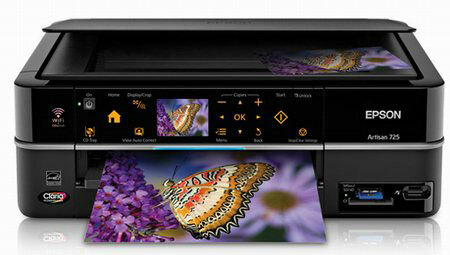 Epson Artisan 725 printer is equipped with a special control panel and Smart Touch 2.5-inch screen. As a model Artisan 835, then it is 7.8-inch touch panel, a built-in diagonal display increased up to 3.5 inches. Both MFIs issuing 9,5 black and white pages per minute and 9 color pages in the same period of time. Release Artisan 725 and 835 is scheduled for this month. The older model comes in black, and younger will be available in black and white hull. This entry was posted on Friday, August 6th, 2010 at 10:08 am	and is filed under Epson, inkjet, multifunction. "A Disposable Printer For Your Camera"
"Canon’s New Leading MFPs: PIXMA MG8140 and PIXMA MG6140"